Great Cuisine on Cumberland Street! The Shogun Japanese Restaurant was a place that I have made various visits to, but never had the chance to document it here on Foodie Utopia! On my visit there for my friend Jacob’s birthday treat, I managed to document our visit there for all my viewers here on Foodie Utopia! Let me tell you what we ordered! We ended up going with the Love 20/20 for Two, which came with a variety of only the best of Japanese cuisine. I had no doubt in my mind that the selection was perfect for the two of us, providing us with taste, quantity and quality. The meal was served with two miso soups, two bowls of salad with their signature sauce, edamame and assorted tempura to begin the meal. This was a great selection of starters – I really enjoyed their miso and salad because it was served fresh and the clash of the two is generally a great starter with all Japanese cuisine. 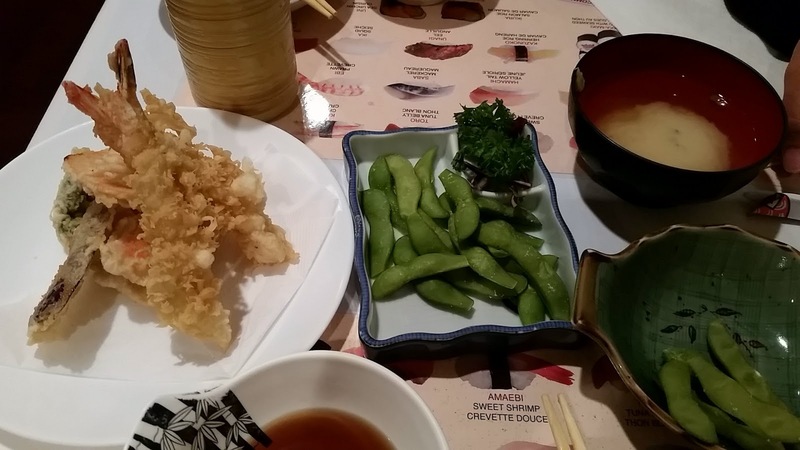 Moreover, I always enjoy eating edamame and shrimp tempura, both of which were cooked beautifully. Jacob’s visit here was actually his first time in a very long time eating Japanese cuisine, and previous visits made him lose his interest in the cuisine. I was happy to know that making him come with me to Shogun changed his mind! 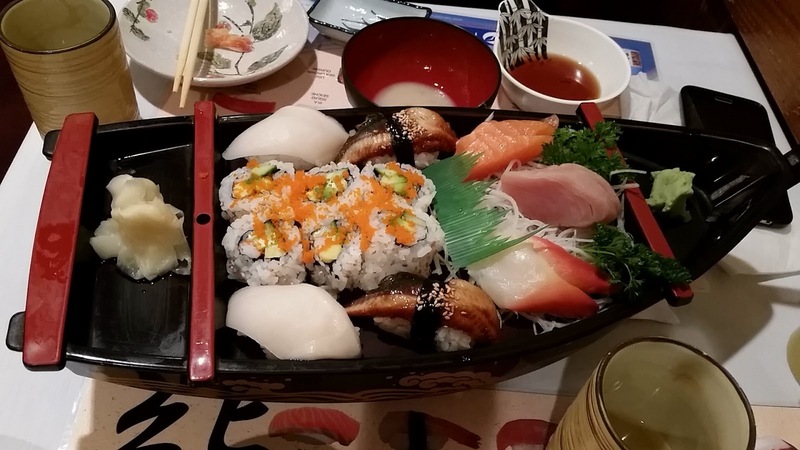 The fun part came next – getting our Sashimi and Sushi Boat which was not only beautifully displayed, but had a great selection of sashimi and sushi. 6 pieces of rolls, 2 pieces each of white tuna and unagi sushi, and 6 pieces of assorted sashimi of only the best fish, can only go straight to one’s stomach! And if that wasn’t enough, the dinner also came with your choice of udon noodle soup which filled our stomachs to its maximum capacity for the night. 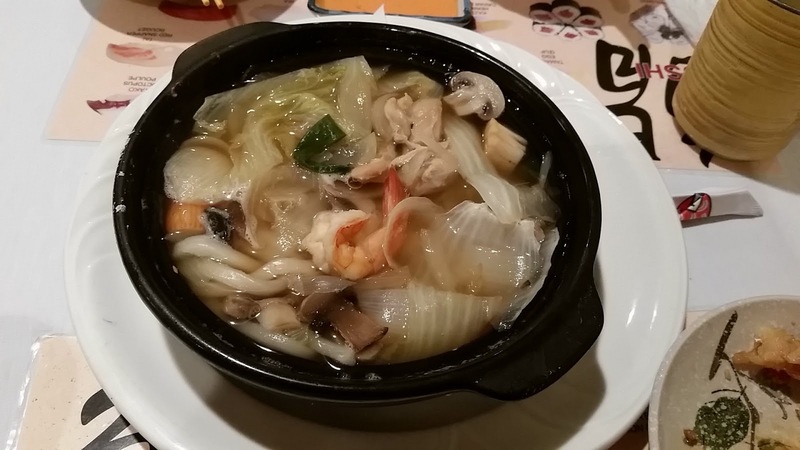 We made our choice of Nabe Udon that night and it was absolutely splendid! We enjoyed our meal all with hot green tea, and the restaurant served us fresh orange to end off the meal as well. Overall, my visit to Shogun was a pleasant one, and being able to convince my friend that Japanese cuisine is a beautiful blessing, was almost as satisfying as the food itself!